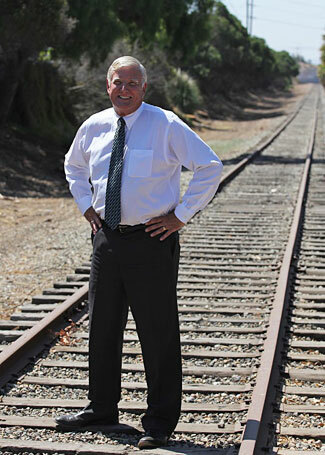 San Diego County Supervisor Greg Cox is a champion of active transportation, open space and preservation, and outdoor recreation. His career in public service, and his role as a planning advocate, began over 30 years ago. He has been instrumental in leading the planning of some very exciting transportation projects across the southern part of the San Diego region including the development of a regional 24-mile bike path around San Diego Bay, which has been nationally recognized for its community-wide accessibility. Cox has served in a wide array of city and county leadership positions, all of which have significantly impacted planning in and around San Diego. 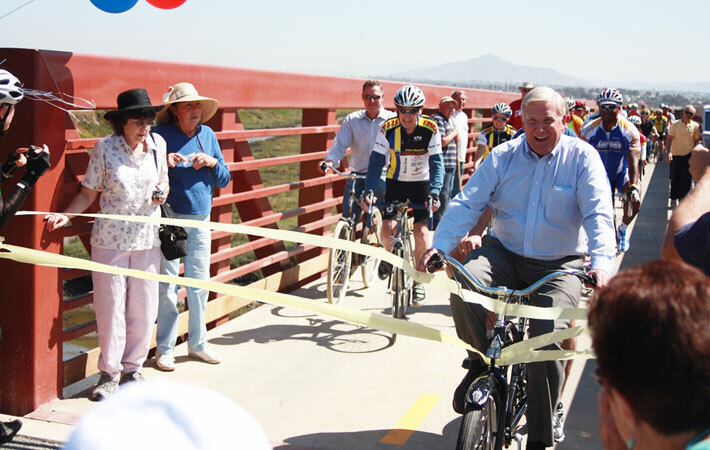 As mayor of Chula Vista in the 1980s, Cox led the groundbreaking regional effort to complete a 24-mile, class I bike path looping around San Diego Bay. Today, the Bayshore Bikeway connects five cities and a number of parks and recreation facilities, including the Sweetwater River Bike Path and the Otay Valley Park trails. The Bikeway has become a nationally renowned rail-trail often held up as an example of trails that serve a wide cross-section of the community. For his work on the bikeway, Cox was named one of the 25 inaugural Rails-to-Trails Conservancy Rail-Trail Champions in 2011. He donated the $1,000 grant award in his honor to the San Diego County Bicycle Coalition, further showing his support for the active transportation movement. "There's a saying that if you really want to see a country, you go by rail," said Cox. "I believe that if you really want to know your community, you go by bike. By converting and connecting rail lines to bikeways, we are taking an underutilized feature of our urban landscapes and turning them into recreational amenities that provide for exercise, recreation and, most of all, open up our little corners of the world for all to enjoy." San Diego County Supervisor Greg Cox. Cox has previously served as the director of local government for the California Office of Planning and Research, and currently serves as a member of two important planning agencies, the California Coastal Commission and the San Diego County Regional Airport Authority. He has served for many years as chairman of the Bayshore Bikeway Working Group at the San Diego Association of Governments (SANDAG) and the Otay Valley Regional Park Policy Committee. His interest, experience, and work with planning advocates, grassroots activists, and professional planners has demonstrated his clear understanding of, and support for, the role of planners. Supervisor Cox riding his bike on the Bayshore Bikeway.